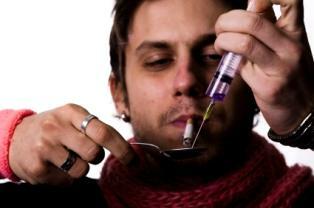 Learn about a highly addictive drug with these heroin facts. Heroin comes in three different colors: white, black, or brown. The coloring of the drug depends on where you buy it in the country. It's produced from morphine which is derived from opium. You can inject, snort or smoke heroin. People inject Horse to receive a quicker and more intense high. Early addicts typically choose to snort or smoke the drug. Like morphine, heroin numbs pain. It's a downer or a depressant. It's helpful to know the heroin facts about the health effects of this drug in order to understand how detrimental it is. It suppresses the central nervous system. Heroin impairs mental function and automatic bodily processes such as breathing. Respiratory failure is possible if a user begins to experience slower, shallow breathing. Overdose is common due to high tolerance levels. It's possible to develop collapsed veins from injections of heroin. Infections (mainly of the heart lining and valves) and abscesses are also common. Heroin use contributes to the possible onset of liver and kidney disease. The clogging of blood vessels is probable when Smack is laced with certain additives or contaminants. When researching heroin facts, it's important to know about the withdrawal effects of the drug. Withdrawal symptoms will peak around 48 to 72 hours after the user has ingested the last dose. Some people experience withdrawal symptoms for as long as a few months after stopping the drug. The following heroin facts include statistics on its use across the United States. According to the US Justice Department Heroin Fact Sheet or NSDUH, 76,000 adolescents between the ages of 12 and 17 have used heroin at least once. The same survey found that 474,000 young adults ages 18 to 25 used the drug at least once. Furthermore, the survey found that the mean age for first time use of heroin is 20.7 years old. According to the heroin facts list on IntheKnowZone.com, a heroin addict spends about $150.00 to $200.00 per day buying Brown Sugar. Citing this same source, more than 80 percent of users inject the drug with another person. Interestingly enough, 80 percent of individuals who overdosed were found alone. Out of all illicit-drug-related emergency rooms visits, heroin makes up 14 percent according to IntheKnowZone.com. Having heroin facts available can help you discuss your loved one's addiction in a persuasive way. Hearsay about the drug isn't nearly as alarming as the cold hard facts. While the addict may not want to listen, there may be one thing that will strike a chord with your loved one that may help set the ball in motion towards recovery. If not, continue to provide support and encouragement until the addict finds the strength to seek treatment.